A student delegate of AAPSU led by President Hawa Bagang and General Secretary Tobom Dai called on Chief Minister Pema Khandu at his office here today. The Chief Minister congratulated the newly elected members of AAPSU and advised them to work for the welfare of the students. Responding to the 17-point memorandum submitted by the student union, the CM expressed happiness that the issues raised were genuine and were mostly focused on education. Asserting that the present government is keen to provide transparency in its functioning, the Chief Minister urged the union to work constructively and raise constructive issues. He said even the legislators should raise issues against department anomaly and misconduct. Khandu said the present government is trying its best to mend the ailing education sector by rectifying the recruitment process of the teacher. He informed that the government is attempting to prevent all back door entry in the employment process admitting candidly that sometimes politicians do succumb to public pressure to give them undue favour. Taking cognizance of the irregular calendar for recruitment process conducted by the Arunachal Public Service Commission (APPSC), the Chief Minister said to correct such past practises, a person of high reputation and dignity, former civil servant Tajom Taloh has been appointed as the chairman of the commission. He said that unlike in the past where people from political background were selected as chairman, this time a person from civil service background has been appointed. The Chief Minister said that state government is attempting to conduct recruitment process of all departments through the commission only. This will prevent all those back door channels through which illegal recruitment is conducted, and people pursuing for such methods will be discouraged. Also the Chief Minister informed that education department has been instructed to rationalise all teachers posting so that overcrowding of teachers in urban areas can be minimised and shortages of teachers in rural areas can be met. He asserted that the state government will not compromise in quality service for health and education sector. Pointing out that due to opening of numerous schools in remote sparsely populated area, Khandu said that many such schools were non-functioning due to non-availability of students. To rectify such cases, he informed that the department has been directed to collect list of such schools that are running without adequate numbers of students or where there are none. Accordingly, all Deputy Commissioners have been instructed to verify such schools so that non functioning schools can be clubbed so that non-availability of students can be sorted out and teachers engaged meaningfully. On SSA teachers, the Chief Minister informed that state government is also working out mechanism to regularise their job. He informed that department has been instructed to work out a mechanism to absorb performing teachers possibly through some form of competitions amongst them. He also informed that state government has released the pending salaries of the SSA teachers. 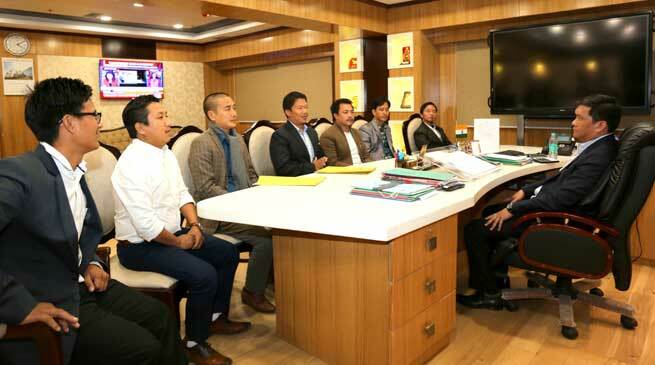 To make Arunachal University at Pasighat a fully fledged one, the Chief Minister informed that for infrastructure development, Rs 10 crore has been sanctioned. Also he said that education Parliamentary Secretary had visited the institute to take stock of the present status of the University. Regarding Unlawful Activities (Prevention) Act implemented in the state, the CM admitted on the stand of the union that much of the unlawful activities could be prevented through the existing CrpC and IPC codes. He, however, said if the citizens are law-abiding, people have nothing to fear from such acts. Further to derive consensus on the issue, the CM said an all party meeting and meeting of community based organisations will be called soon. On objection of AAPSU to the 50:50 one-time recruitment policy for APST and non-APST candidates in teachers recruitment for science and maths teachers, the Chief Minister assured the matter will be examined through the department. Regarding usage of Aadhar card for student stipend, the CM said the state is trying to move towards cashless economy, which is as per the directions from Prime Minister of India. He said the use of Aadhaar will minimise corruption in stipend disbursement, as the account will be directly linked with the student. Also it will cut off the illegal intermediary means through which funds are siphoned off. To cover maximum citizens under Aadhaar card, the CM said the state government has procured enough machines so that more number of people can be covered. Also he said DCs have been instructed to help people avail Jan Dhan scheme and open bank accounts.